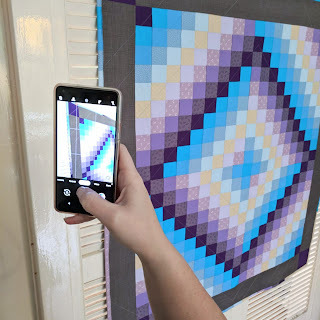 My husband sneakily took this as I was taking pictures of the finished quilt, I think it's a pretty cool photo! Last week I made this trip around the world quilt for a Sewing Quarter demo. 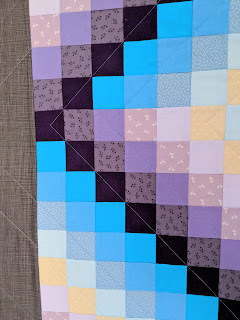 Now these aren't all colours I would normally go for but I really like this combination of pastel colours with the deep purple and bright blues. It's a mix of solids, Linea and prints from the Bijoux range by Makower. 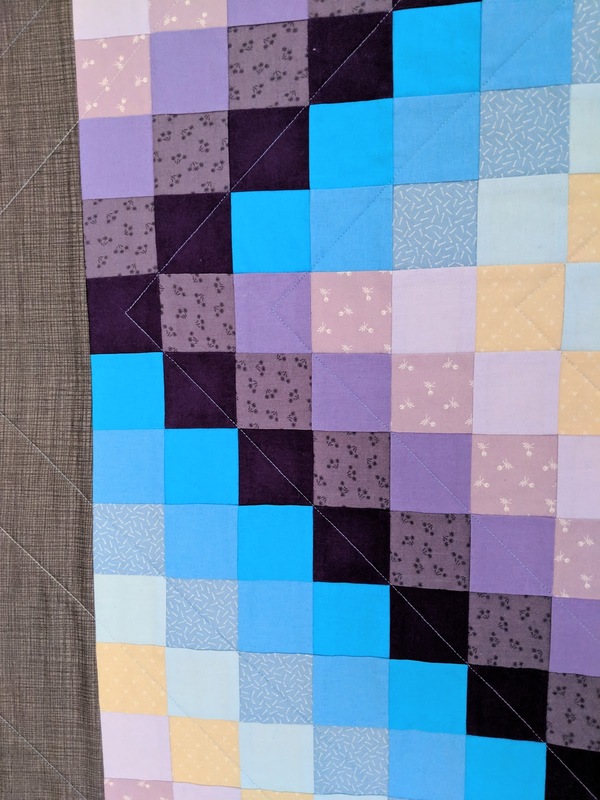 Cutting strips from 'tubes' for the blocks leaves you with some extra, so I used some of them in the binding too. 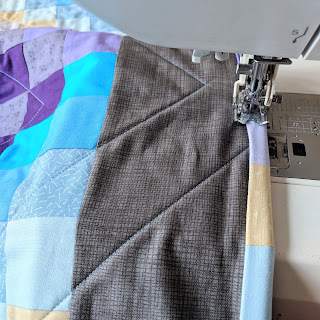 I made sure to press all the seams open so the binding wouldn't be too bulky and I interspersed it with strips of the print fabric to avoid having seams in the corners. 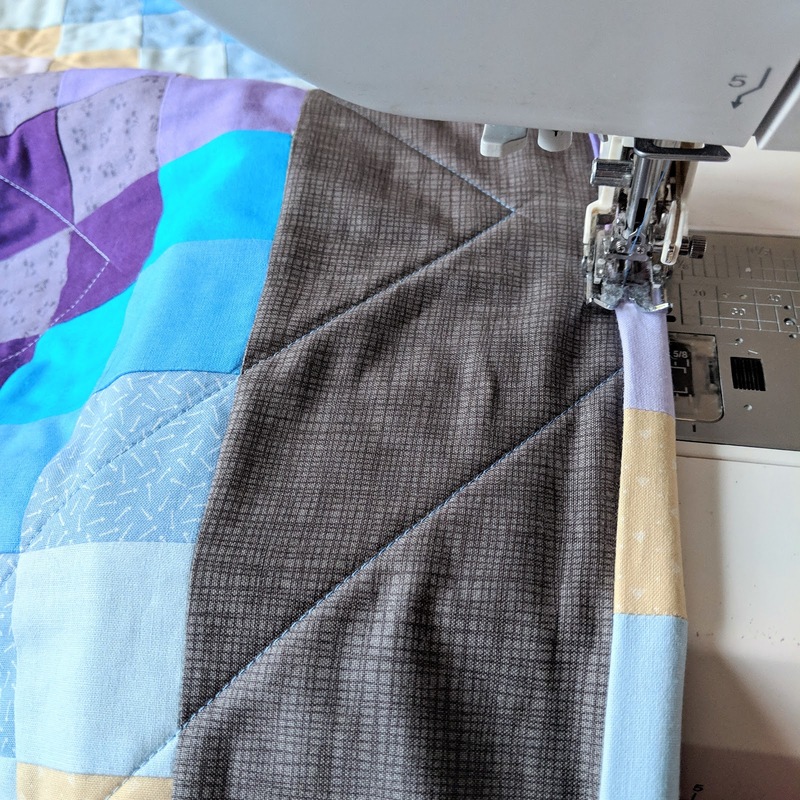 I made a long strip for binding and then laid it out around the quilt to make sure! 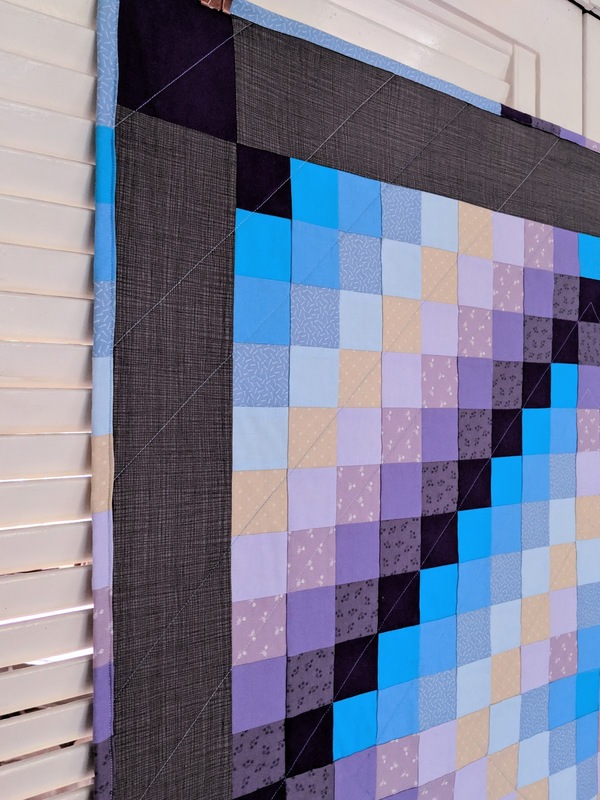 Good job too because I had to add in another fabric strip between the pieced sections to make it work. 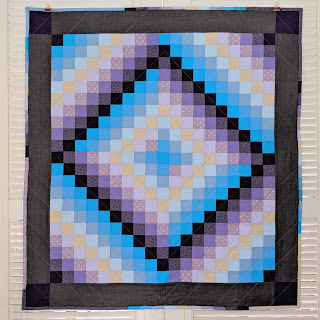 I quilted diamonds radiating from the cross in the centre. Rather than have them be spaced evenly apart (my usual style) I decided to space some lines 6.5" and others 4" apart. It just makes it a bit more interesting and adds to the illusion of the quilt. 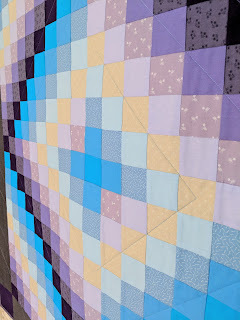 For the borders I added in more of the dark purple in the corners, I like that it suggests the pattern continuing. Overall I am really happy with how it turned out. I spent a long time playing with the blocks and turning them round. 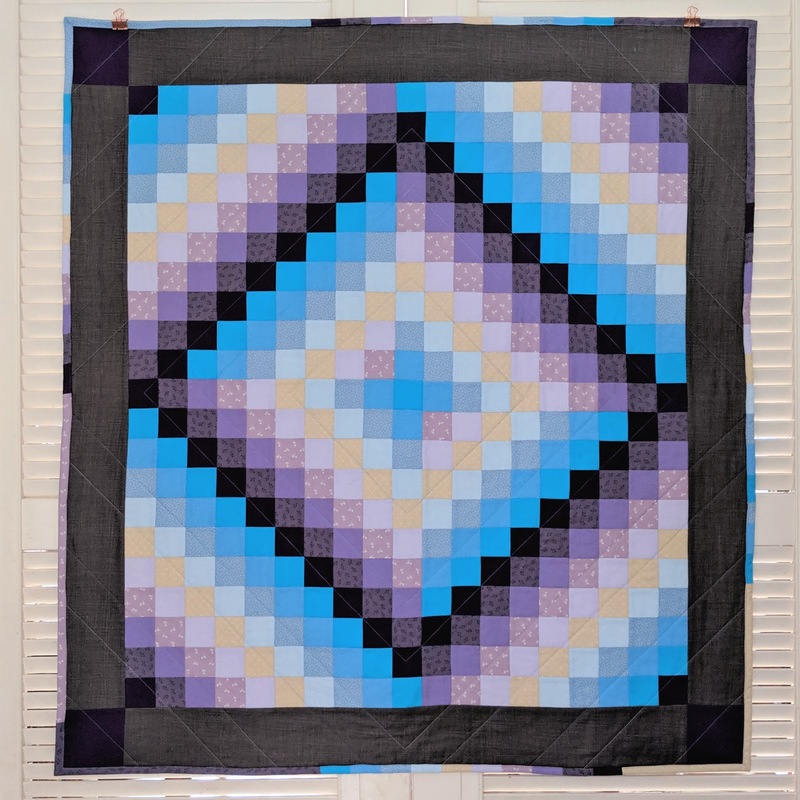 I did add in the row across the centre to create the cross in the middle and am pleased with the way the gradients play throughout the quilt. 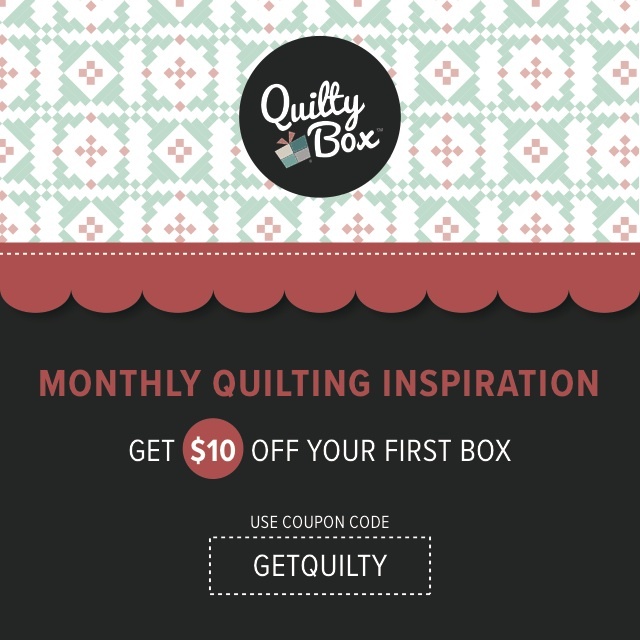 I can totally see why trip around the world quilts are so popular and I will definitely be making more! 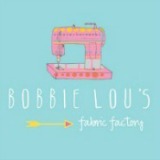 Such a pretty quilt Lucy! The last photo real shows how it glows!